I got to spend some time with a group of kids and moms this past Sunday. 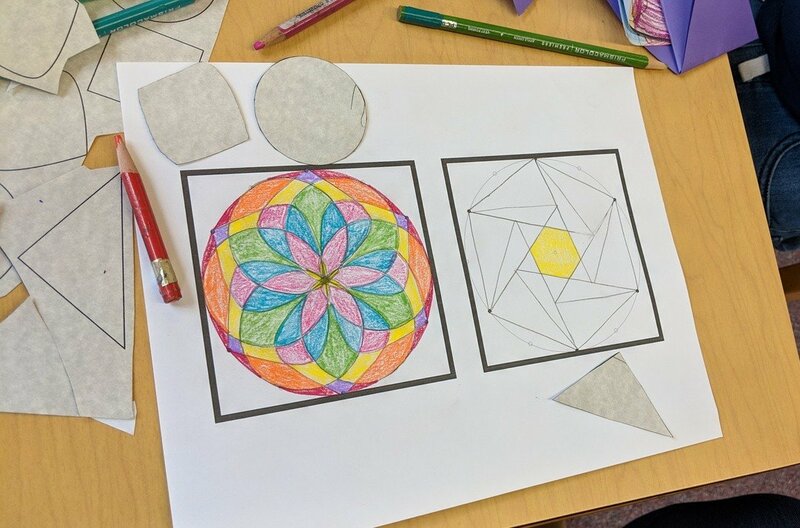 They had asked me to plan a math/art project for them. 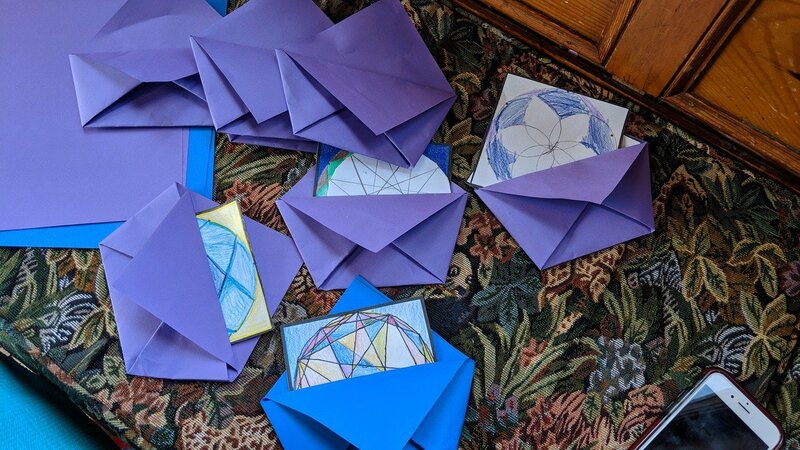 Last time we did this we played with shapes scaled according to the golden ratio. 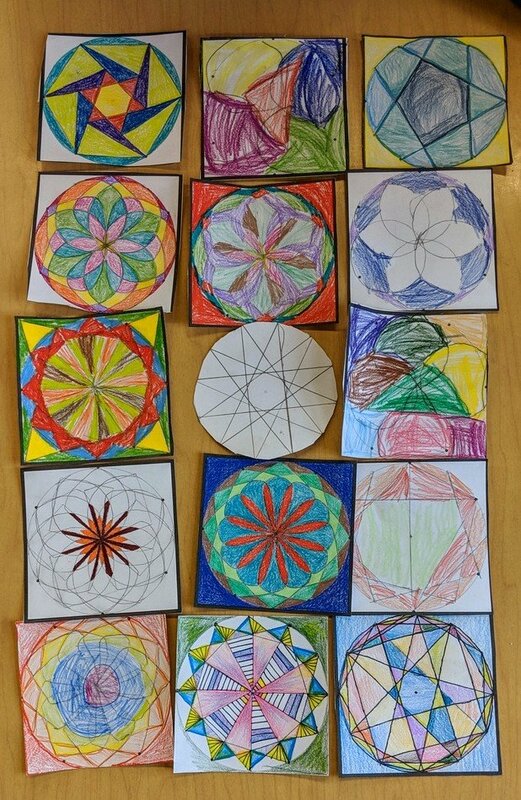 This time I wanted to help them make images that are made by rotating a graphic around a circle. 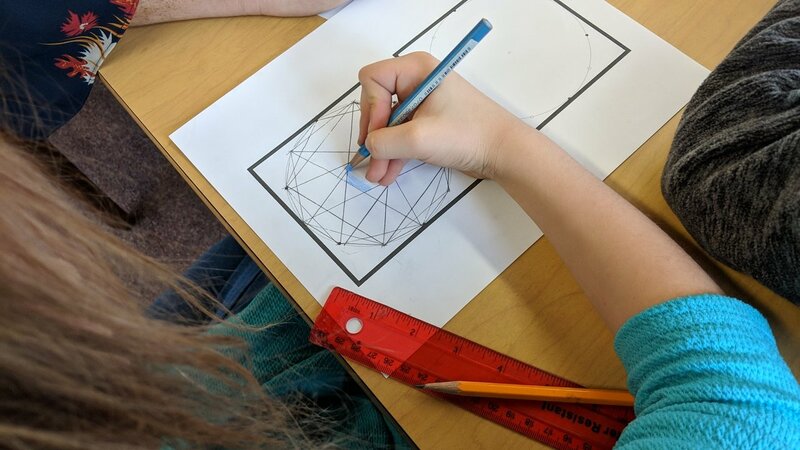 We used a circle that was divided into twelve equal sections, and we got to talk about how rich the number 12 is, in that it comes up often in measurement of time (hours, months), quantities (dozen), distance (Inches) and so much more. Images were made in two ways. 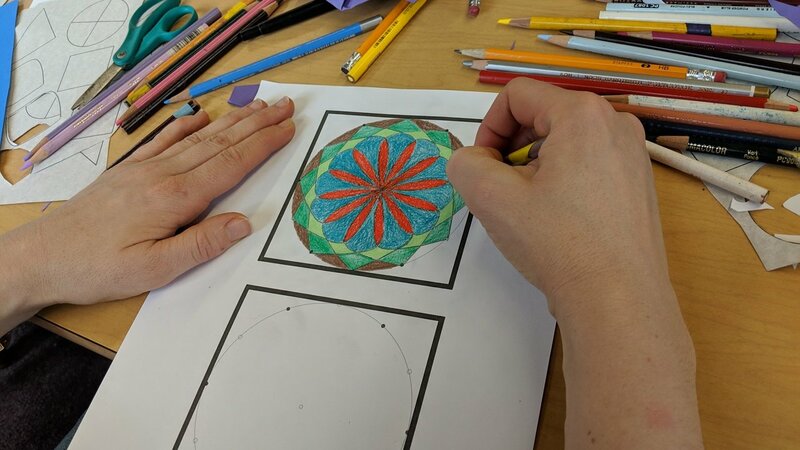 One was to connect the dots around the circle according to a rule, such as connect the first dot to the fifth, connect the fifth dot to the tenth, connect the tenth dot to the dot that is plus+5 further around the circle, then continue until you are back where you started from. A star emerges! 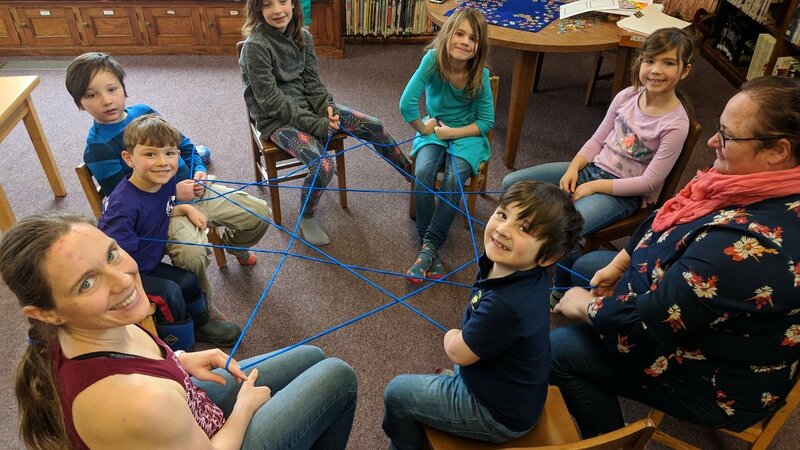 We started the afternoon by sitting in a circle of eight people, and doing the skip-counting activities that I described above. This was actually a thrill to me, as it’s something I’ve wanted to try out for a long time. As the star shape grew within the circle of people, who were the “points”, everyone was thrilled. They had no idea a star would emerged. I knew, but I was thrilled too. 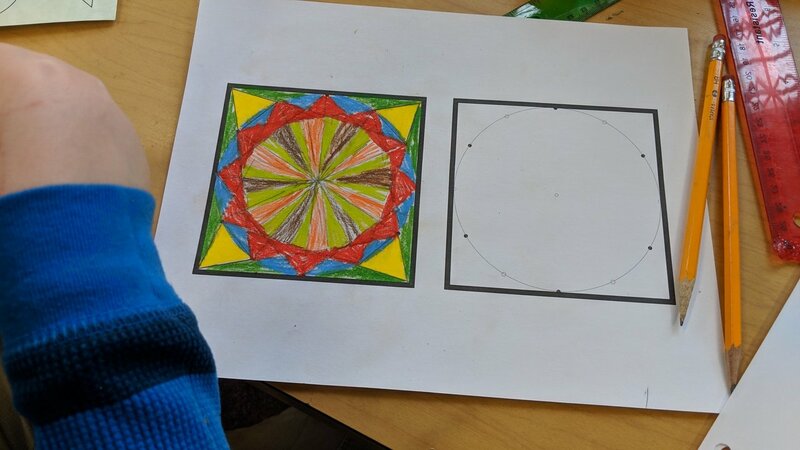 I had PDF printout of circles and shapes.People cut out shapes that they wanted to rotate around the center, then colored them in if they wanted to. I think the young man who did this image is about 8 or 9 years old. The moms seemed to like this activity at least as much as the kids. I never know how these projects will go. A couple of the boys didn’t want to be coloring any more after a while. 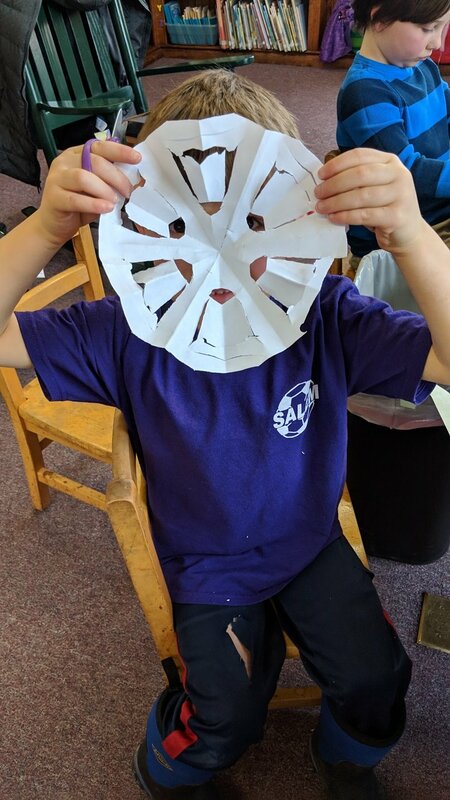 One boy in particular really liked cutting paper, so I got him started with another kind of rotational symmetry: making snowflakes! I hadn’t thought about snowflakes beforehand, but liked the way I was able to link to something that was already familiar to this group. 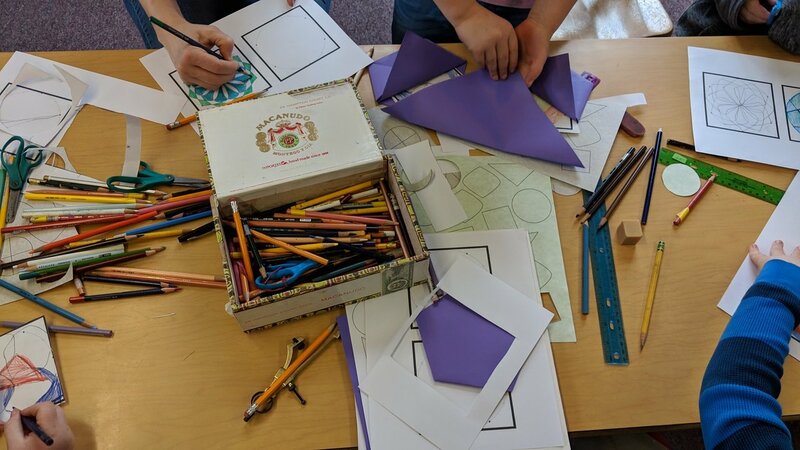 After awhile one of the girls was finished with coloring, I showed her how to make an origami pockets that were sized for the drawings to slip into. She really liked making the pockets, and made them for everyone. This also let me segue into showing her how to make a square from a sheet of paper. In the end, we had made lots of images, pockets, snowflakes and our work area was delightfully messy. Everyone helped with the cleanup, especially with the tiny pieces of paper on the floor. At the end we put our tiles out on display. A couple of hours later one of the mom’s texted me saying that, on the way home, her kids were asking to do more of these. YAY! Next Post Maybe Time to Put Away the Rest of the Holiday Cards?